Delight in the year-round display of plants and flowers and enjoy the added space a garden window gives to any room. 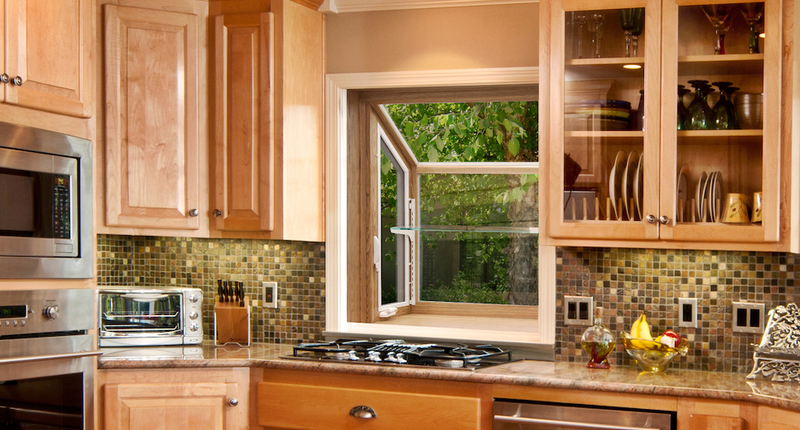 With a custom garden window from Kelly Window and Door, you can capture the sun’s warmth in the winter and invite refreshing breezes into your home all year long. Our garden windows come with a multitude of options so you can customize them for your enjoyment and to match the style of your home. The components of our garden windows make them both attractive and extremely functional. These windows incorporate four pieces of energy efficient glass that will bring light into your home. The side panels swing outward from your home to allow for efficient, two-sided ventilation. The vinyl frame and rust-free, durable cast-aluminum hinges are maintenance-free. The vinyl base provides an easy-clean, water-resistant, no-rot surface that can be customized in several colors. We would be happy to give you a demonstration in the comfort of your own home with a free in-home consultation. Or, if you prefer, you can call 919-461-0010 to schedule a showroom appointment for a hands-on demonstration of our products.